Career: Built as ZEALANDIC for Shaw Savill & Albion. 1926 transferred to Aberdeen Line as MAMILIUS 1926, back to Shaw Savill as MAMARI 1933 [reported dates vary]. 1939 sold to Admiralty and refitted as decoy version of aircraft carrier HMS HERMES. 4 June 1941 attacked by German aircraft near Cromer, hit wreck and ran aground. Wreck torpedoed by E-boats. Back of a photograph from Peter Bibby mentions MAMARI in the River Blackwater (but quotes date 1930). Photograph LIL_AB1_039 shows vessel that matches the appearance of ZEALANDIC. Dates from Oyster Company ledger - names ship as MAMILIUS and owner/agent as Shaw Savill. Shields Daily News 16 Sep 1931 records her at Tollesbury since May. Above: Shaw Savill line vessel laid up in River Blackwater, before WW2. 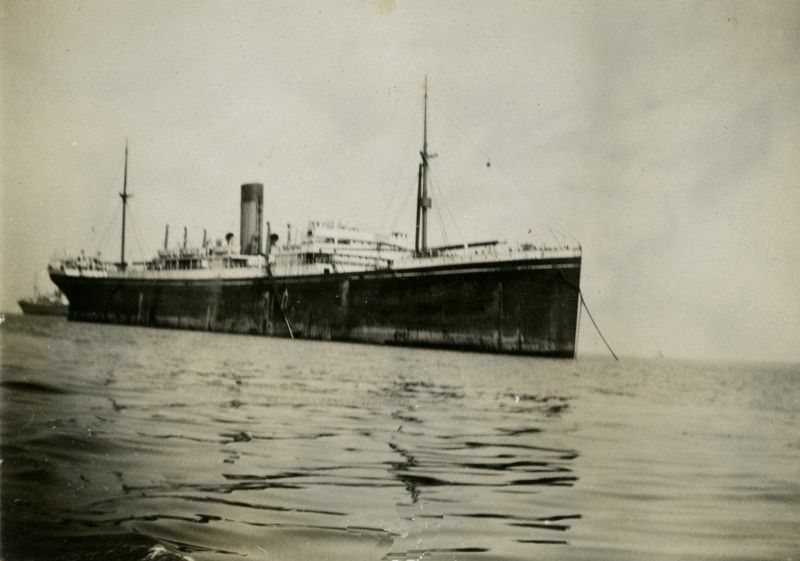 Thought to be MAMILIUS, ex ZEALANDIC-1926, renamed MAMARI-1933. 10,898 tons gross, built 1911. Official No. 131389. Date: Before 1939.